C.F. 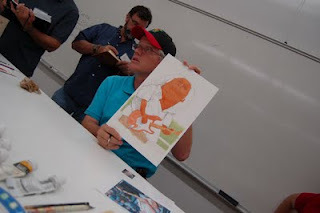 Payne is not only a successful illustrator, he has also been an art educator for years. Currently, he is the head of the illustration department for Columbus College of Art and Design and he also takes guest teaches at Illustration Academy several times a year (see blog about this here). Payne is being honored this year by the Society of Illustrators as distinguished art educator of the year. "All of this [teaching] has allowed me to share with a huge number of energetic, inspired, talented young people the notion that illustration is a meaningful art form, that when taken seriously can have impact and be great. I have tried to be a good teacher knowing that I can learn as much from my students as I hope they can learn from me. If I have done my job right, they have learned more from me."